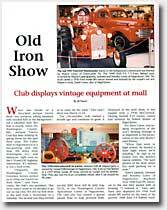 The Hagerstown Valley Mall Antique Tractor Show will be held from March 14th thru March 20th, 2016. In 2002, the event made the Farm Collectors Magazine. For more info, click on the page numbers below. Click here for pictures of the Hagerstown, MD Valley Mall shows.